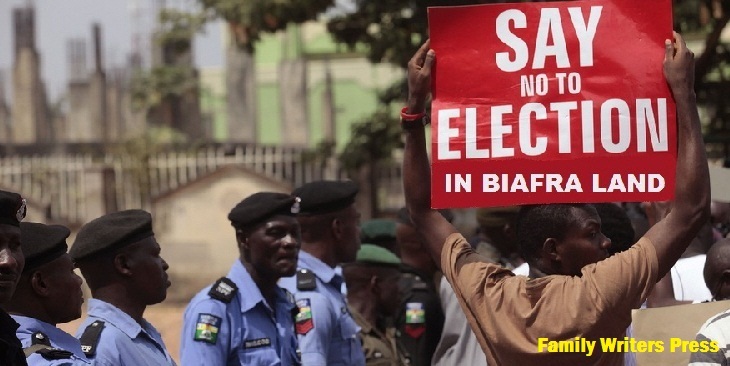 There has been serious misunderstand on the decision of the Indigenous People Of Biafra led by Mazi Nnamdi Kanu as regards to "No More Election" in the entire of Biafra Land. Today, all the directives given to the Biafran people by the leader of IPOB has been carried out to the later and has yielded much benefits to the chagrin of our collective detractors. IPOB have also used many civil disobedience approaches to drive home their complete faith in getting Biafra restored. Boycotting election in the whole of Biafra Land, starting with the proposed Anambra state gubernatorial election which is coming up in November, 2017, is also a work towards a successful end or direction. Make no mistake about it, the election boycott if completely complied to, will set an unprecedented and unmistakable signal to the Nigerian government and even the whole world on the intensity of the Biafra issue which can no longer be wished away or waved with a fling of hand. The Biafra question has become a national issue in Nigeria today and it's glaringly manifesting as can be seen on the recent Kaduna declaration by the Arewa youth forum with the full backing of the Arewa elders. Sincerely speaking, there is no need to continue conducting elections in Biafra Land because the plight of the Biafran people will no longer be swept under the carpet hence, the emergence of IPOB. In a simple parlance "No Election" means there won't be voting or any form of electioneering process to select the leaders that will be representing Biafrans in the Nigerian seat of power. IPOB is asking for a democratical process known as referendum which is usually used in any democratical dispensation for the people to decide their future both politically, economically and otherwise. It is a simple understanding that "democracy is the government of the people by the people and for the people", therefore, Nigeria as a state that practices democracy, should set modalities in motion for "Biafra decide" via ballot box and not bullets. IPOB is not a political party and is not planning to be one tomorrow, rather, IPOB is setting the record straight on the restoration of a sovereign Biafran state. Similarly, the leader of IPOB worldwide has made his stance on Biafra struggle known, he said that he was not born to restructure Nigeria or to implement the Aburi Peace Accord that was agreed by the then Eastern governor, Col Chukwuemeka Ojukwu on behalf of Biafrans and his counterpart Gen. Yakubu Gowon the then Nigerian Head of State, but was born to restore Biafra and Biafra must be restored under his watch. Furthermore, it is in public notice that the incumbent governor of Anambra state, Biafra Land, governor Willie Obiano masterminded the wanton and the most unforgettable killing of IPOB youths during the May 30th heroes remembrance day in 2016. We can't keep electing leaders that can not protect our lives and properties when threatened, hence, the need to stop election and sort or vie for referendum. The killing and massacring of Biafrans by the Hausa Fulani militias masquerading as cattle headers without the swift reaction from the governors and politicians from Biafra extraction in arresting the culprits or bringing them to face justice is highly provocative and their criminal silence on this carnage is mind bugging and can not be allowed to foster. The emergence of Nnamdi Kanu and IPOB is divinely orchestrated and the mandate to restoring Biafra must be accomplished irrespective of the challenges facing them. Be it as it may, the forthcoming gubernatorial election in Anambra state will be used as a litmus paper experiment to ascertain the intensity and perhaps, the preparedness of Biafrans to taking back their sovereignty and as to what will happen when eventually there is No Election in Biafra Land. IPOB hereby, urge all Biafrans to boycott Anambra state election come November, 2017. We did it when we sat at home and will do it again with No Election in Anambra state and then full restoration of Biafra will follow.